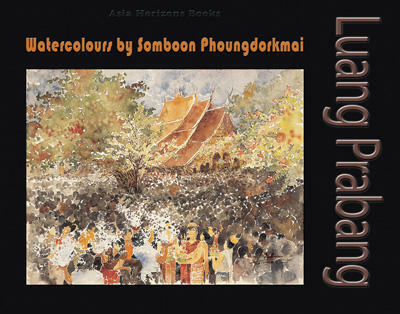 This book which is available in bookstores in Asia presents the work of a Thai artist Somboon Phoungdorkmai and was originally commissioned by the Thai Lao Friendship Association. We eventually had the book printed with the help of Thai Airways airline which now flies to that city from Chiang Mai. The book is also on sale (us$36) at hotel boutiques and several locations in Luang Prabang.